You'll "Retrieve Golden Results with Cheryl Ritchie" on your Southern Maryland & Anne Arundel County Real Estate Sales, Listings & Referrals! Calvert, Charles, St. Mary's Counties plus Anne Arundel! About Cheryl Ritchie a.k.a. "The Golden Girl"
Cheryl Ritchie is a RE/MAX Leading Edge 35 year licensed Maryland Realtor whose experience plus technology tools combine to give you the Golden Results you deserve! Click https://goldenresults.me for a Digital Business Card! Cheryl Ritchie believes Golden Results means pursuing continuing education plus remaining curious in conquering the latest technology trends to successfully market homes in Southern Maryland and Anne Arundel County MD! The Golden Girl is an Associate Broker with these GOLDEN designations and class completions : ABR, E-PRO, CRS, GRI, MCNE, CDPE, SRES, Certified New Homes Specialist, SFR, 203K and MRP. 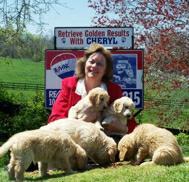 You'll Retrieve Golden Results with Cheryl Ritchie, RE/MAX Leading Edge. Visit www.GoldenResults.com for more information.